The Leamington Spa Art Gallery & Museum in the Midlands owns a painting by Charles Shannon, a portrait of Ricketts: 'The Man with the Greek Vase' (1916), formerly in the collection of Mrs. Edmund Davis. The museum's collection also holds another painting that was given in 1954. This is not a well-known painting, and probably an early one, by Charles Ricketts. This is called 'Choosing a Mask'. It was bequeathed to the museum in 1954 by Cecil French. The oil on canvas painting is not dated, measures 43 x 38 cm, and depicts a figure in an interior. 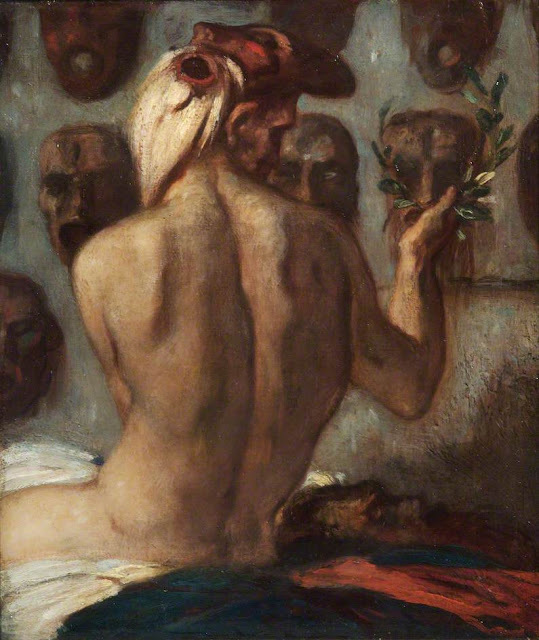 The catalogue's description is: 'A naked man is sitting and trying on a mask with his back to the viewer. There are many other masks on the wall in front of him'. Ricketts started painting around 1900, copying the darkness of Renaissance masters, and these early paintings are by now extremely darkened (they were thus in the 1930s). But this painting is not darkened, and the tone is lighter, and more colourful; it might date from a somewhat later date. There is a red chalk sketch for this painting in the Tullie House Museum and Art Gallery in Carlisle, along with two pencil drawings. A fourth preparatory sketch is in an album with proofs and drawings. 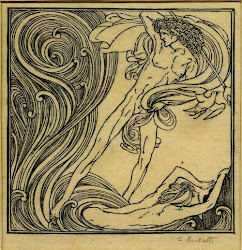 As the other drawings in this album are all of early works by Ricketts, it is perhaps not unreasonable to suggest that this painting was of around 1905. It is suggested that it was the first painting by Ricketts that was exhibited.